To prepare for our trip to Beijing, Jason thought it would be a good idea to visit Chinatown in our home city of Portland. 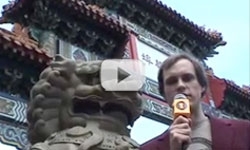 In our first video, Jason seeks advice for the trip and learns some things about Chinese culture. Check it out! I can’t wait to go to the Olympics and I couldn’t have better teammates than Captain Jeff and Jason. Watch out world! ALL OF US HOPE U COME TO BEIJING ,TO KNOW MUCH MORE ABOUT CHINESE, WE GONNA TO SHOW A NEW CHINA TO U ,U HAVE EVER SEEN IT BEFORE. We r ready!!! We are not awesome at all!! !We are one of the most kindest nationality in the world!!! How could u say that? hey mans bring me a gift, and the idea is awesome. Hey, I think some of you misunderstood Goro. "Awesome" is a positive word. When something is awesome, it is cool, wonderful, or impressive. Goro is innocent! He didn't sat anything bad!